The magnificent Jar candle that will lit your house with the dazzling brightness comes in the dimension of 55mm*55mm*85mm. The material consists of fine wax and glass. Its brightening shine will give your home the charm, needed to decorate your dream home. Its yellow coloured wax, will bright up your nights. Decorating the favourite corner of our world is one of most longed thing we all want to do, so why not light it up with the most vibrant Jar candle. This jar candle will make your room look vibrant, spacious and well-lit. You can also decorate it for special dining, its dazzling yellow sparkle will make you room look cosy and will make it look romantic. You can also decorate it for any parties or special invitations. Above all, it's your close cosy comfort zone; you can lit it up to make your evenings look brighter and shinier. The jar candles will not only brighten up your favourite corners, but its scent will enrich the aura of your room. The fragrance will add mystic charm to the brightness of your room. 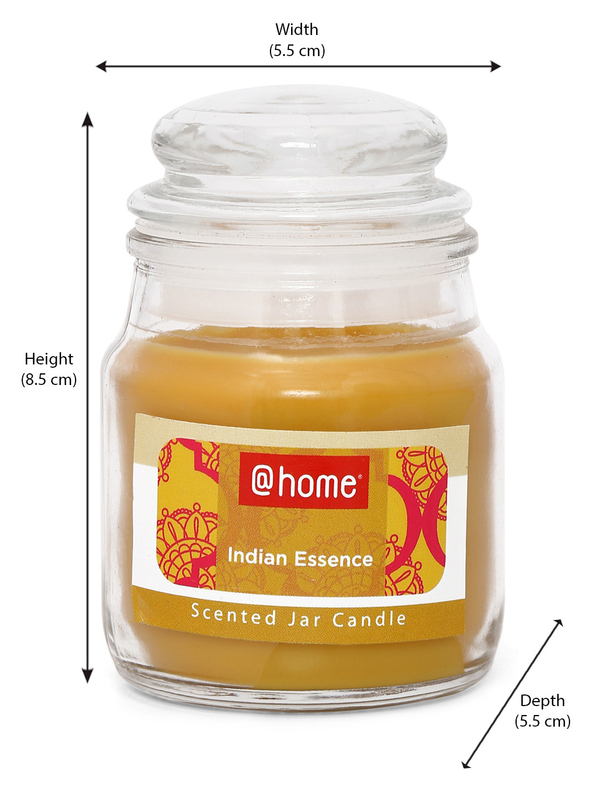 So, hurry up and purchase it at @home.co.in/decor/Indian essence jar candle, yellow and make your room feel like heaven.